In a large bowl, combine the grated cassava, 1 cup of the sweetened condensed milk, the coconut milk, 3/4 cup granulated sugar, eggs, egg yolk, salt, and vanilla and mix well. Bake the cake for 55 to 65 minutes or until it is set and the top is very lightly browned. Remove the cake from the oven and place it on a wire rack. To make the topping, combine the flour, 1/4 cup sugar, light cream, remaining sweetened condensed milk, and cream cheese in a medium saucepan. Place the saucepan over medium heat. Cook and stir until the mixture is smooth and starts to thicken. Pour the cream cheese mixture over the cake. Sprinkle with the coconut. Broil the cake for 3 to 6 minutes, watching carefully and turning the cake occasionally, until the topping is browned. Remove the cake from the oven and let it cool on a wire rack. This cake recipe is popular in the Philippines. Cassava is a woody shrub. Its root is peeled and grated for use in this cake. You can use light cream in place of the sweetened condensed milk if you'd like, or use all coconut milk. 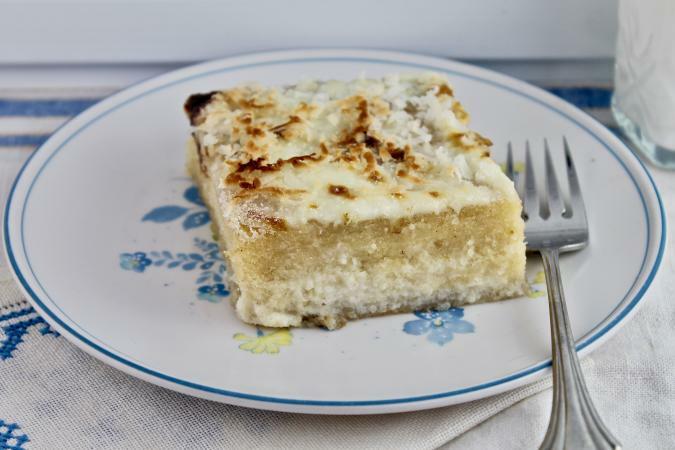 Some recipes for Cassava cake, known as Bánh khoai mì, call for using shredded Cheddar cheese in the topping, which makes the topping orange. You can substitute 1-1/2 cups shredded Cheddar or Colby cheese for the cream cheese in this recipe. If you choose this variation, omit the shredded coconut on top. Frozen grated cassava is available at many large grocery stores, or you can order it online. This cake is delicious after an Asian or Philippine meal, or you can serve it as a snack with coffee or tea.